There are a lot of gardeners out there that are surprisingly daunted by the prospect of growing roses around their home or gardens. For the most part, the ones I've spoken with seem to feel that roses are too much work and require too much maintenance to really be worth the effort. Oh how I disagree! Usually after speaking with them for a little on the basics, I've found that they seem much more interested in the idea, if you can address a few of their key concerns. So it got me wondering, how many other gardeners share this same sentiment about growing roses? I've written countless articles on roses now, some of them covering the basics, some of them getting more detailed into specific varieties. However I realized that while I had covered much of this information in separate locations, there was no specific article on how to plant roses. So let me correct the oversight here by compiling all the information into one, easy-to-read guide. This is geared more for novice gardeners who have yet to get into growing roses. The location should get good sunlight. Now when I say "good", I'm talking a minimum of 6 hours, but preferably 8 or more. Most roses can grow and survive in partial shade locations, but in order for them to really perform they need a lot of sunlight, so don't try to force them into a space they just aren't suited for. 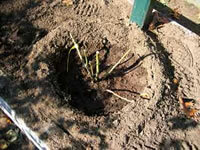 Learning how to plant roses is about giving them the growing requirements they need. The same can really be said about most plants, however roses can sometimes be very unforgiving if planted in the wrong locations. Proper soil composition is one area that can be so important to the development of roses that I've always found it odd that most gardeners don't even give it a second thought. I hear time and time again that "all my other plants do ok". That may be true, but how many of your plants do exceptional? If you are just looking for an "ok" garden then by all means you can skip ahead to the next section. On the other hand if you would like to get the most out of your time spent in the garden, read on. I'm not going to get all technical on you here about how to plant roses in the best soil. There is actually another great article already written in our vegetable section on preparing soil, if you want specifics for your soil type. As a general rule, I tell everyone don't just dig up your existing soil and stick a rose in the hole. Do yourself a favor and pick up a bag of organic compost from your local garden center. The bags are generally cheap and widely available everywhere. When you are ready to plant, keep a wheel barrow handy and place the dug up soil into the wheel barrow, and mix it 2 to 1 with the organic compost. Then backfill the hole with your new mix. 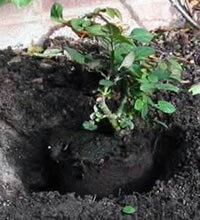 You would be amazed at how such a simple step can go a long way towards getting your roses established with strong root systems. Amending your soil will not only give your roses a great start, but it will also help make sure it has the right balance for drainage as well. 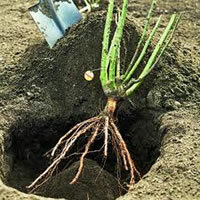 If your soil is too high in clay content, the water doesn't drain properly and the roots of your plants may become choked. 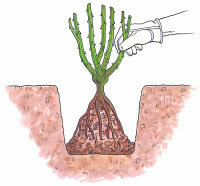 If your soil is very sandy, it will drain too quickly and the roses will not get many nutrients from the soil. Adding organic compost will help resolve both of these issues for you. You should make sure that you choose a location that is not shielded from the natural air flow of your garden. Air circulation is a critical element in learning how to plant roses because this can be the make or break issue when it comes to pests and diseases. While roses love water and it helps them produce all the blooms they are loved for, they also do not like to stay wet for long periods of time. Sometimes this is just a result of overwatering, but often it can be something as simple as a poor location. If the location you're thinking of tends to stay damp or develops mold on the rocks or side of your house, that's probably a bad location to plant roses. I've had more than one grower tell me that they don’t bother growing roses because they have to constantly feed them with special food. Nothing could be further from the truth. I have roses in my garden that are amazing every year and I don't put a drop or granule of fertilizer on them. I also have others that don't seem to do well unless they get fed. It comes down to choosing the proper variety and you will find that there are plenty of options for low maintenance roses. As a rule of thumb I usually will give roses a single feeding in early spring, with a nice all-purpose organic granular fertilizer. I stay away from the liquid chemical ones. That is usually sufficient for my expectations. If you want to put the time into diligently deadheading your roses for additional blooms, you can feed them two more times in the growing season, just make sure you leave at least 4 weeks in between feedings.